Often clients see amazing results from our low-pressure cleaning and media blasting of surfaces that can remove many years of dirt, grime, and dead wood fibers. This will start allowing you to see the beautiful home you’ll find at the end of any complete cabin restoration. 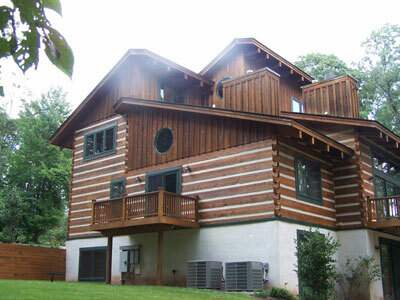 The exterior of your house needs the right protective log home sealants and finishes. If your home has not received care and attention in recent years call us for a log home inspection this can quickly determine if your home needs any repairs or maintenance needed. Call us at 800-781-2551 to find the log cabin restoration expertise you need to recovering its structural integrity and reviving its natural beauty. Over decades of work, our team has expertly worked on hundreds of cabins, log structures, and log home restoration projects. When logs need to be replaced, Performance Log Finishers can match the same method, style, and precision used to build the original home or building. Contact us today by calling 800-781-2551 to learn more about how we can help restore your log home.